Here is a classic stand-off comparison between two contrasting styles of American Syrah. I've been enjoying the Ninety Plus Cellars Lot 101 Syrah recent release as written here in my blogpost. So when son Ryan said he was bringing a highly rated Ojai Vineyard Central California Syrah to Christmas eve dinner, the challenge was on. Erin prepared a delicious beef tenderloin while Ryan prepared succulent lobster tails for a gala Christmas eve family dinner that included twice baked potatoes, Barb's green beans in bacon and herbs, and Alec's salad, followed by Baby Jesus' birthday cake and decadent dark chocolate mousse. I reviewed this wine last week in my blogpost. I love this style as my preferred profile of a Syrah, thick, chewy with sweet forward fruits. Dark inky colored, medium to full bodied, this full throttled Syrah reveals layers of blackberry and black currants fruits with tones of sweet vanilla, caramel and spice with hints of black pepper on a lingering smooth silky tannin finish. Since 1983 Ojai Vineyard have been producing central California wines in the French style of Burgundy and the Rhone valley. Adam Tolmach studied viticulture and enology at UC Davis and worked at Zaca Mesa in Santa Barbara County after graduating in 1976. He co-founded Au Bon Climat with Jim Clendenen in 1982. After nine years Adam sold out to Jim to focus on Ojai Vineyard where he planted Syrah and Sauvignon Blanc on the property his grandfather bought in the Ojai Valley in 1933. Today the team of Adam and Helen Tolmach and Fabien Castel source fruit from a dozen different vineyards from the coolest districts in Northern Santa Barbara County. They produce wines from Syrah, Grenache, Mourvedre, Pinot Noir, Chardonnay, Sauvignon Blanc and Viognier varietals. They produce about 6000 cases each year across about 15 different bottlings/labels, most of which are vineyard designated wines. This Syrah is another blockbuster in their recent lineup that received huge reviews and ratings. Black color, medium-full bodied, full aromatics of berry fruits, concentrated, complex, still a bit backwards and tight, a core of dark fruits is accented by creosote, licorice, tobacco and herbs with a hint of pepper. 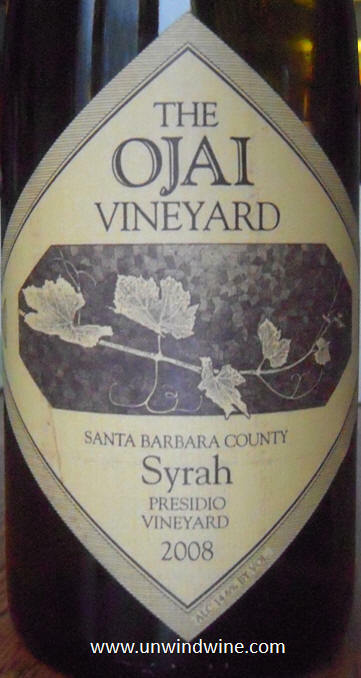 My preference is for the forward fruit filled style of the 90+ while the layers of tar and licorice detract of the Ojai from its appeal for my tastes, Robert Parker loves the Ojai and gives this 95 points. Ryan too favored the Ojai. Parker's description - "Meaty and peppery, with green herbs, bacon fat, smoke, mineral and loads of dark fruit, this medium to full-bodied Syrah has superb purity and definition on the palate. Still backwards and tight, it needs another 2-3 years of bottle age and will thrill through 2024." 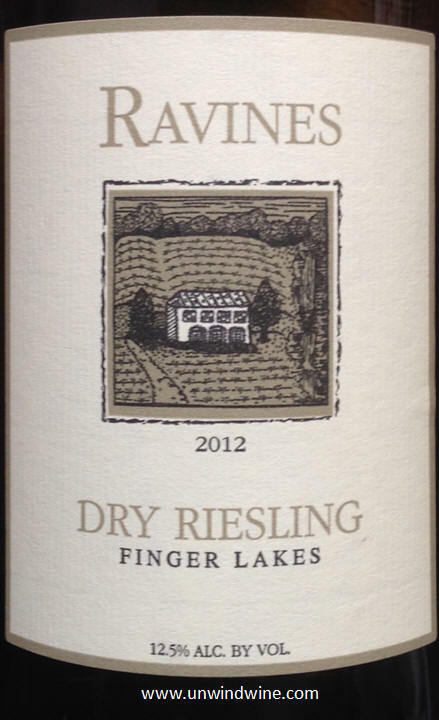 To accompany the lobster, I brought this recent release Dry Riesling from the Finger Lakes region in New York. We visited Ravines during our visit to the Finger Lakes Wine Region in 2012. This is one of the very few Finger Lakes region producers to reach the Chicago market. Their Cabernet Franc and this Riesling can be found currently. As noted in my blog posts from the time, Riesling is the primary and most appropriate varital grape grown in the region. They should stick to what they do best and focus on Riesling and a select few other varietals that are best suited to the climate and terroir there. But unfortunately they stray from the tried and tested approach learned in the old world and produce a wide variety of wines from an extraordinary wide selection of varietals. The result if a lot of mediocre and uninspiring wines. Never-the-less, Wine Spectator recently included Ravines Wine Cellars’ 2012 Dry Riesling in its Top 100 Wines of 2013, ranking it 33rd on the list. Did he say fennel? Yes, I'm afraid so and this tends to detract from the harmony of the fruit. The wine tends to have a subtle but noticeable tone of what some might describe as rubber or tennis ball aromas. I gave it 86 points. Ryan gave it a 85 in his Cellartracker note - "strange wine. overpowering new rubber aroma and flavor..".